Fundamental physics and global climate models both make testable predictions as to how the global climate should change in response to anthropogenic warming. Almost universally, empirical observations confirm that these 'fingerprints' of anthropogenic global warming are present. Back in 1988, NASA's James Hansen made some of the first projections of future global warming with a global climate model (Hansen 1988). He created 3 scenarios which he called Scenarios A, B, and C which used various possible future greenhouse gas emissions levels. Scenario A used a model with accelerating greenhouse gas emissions, Scenario B had linearly increasing emissions, and Scenario C had emissions leveling off after the year 2000. None of these models ended up matching greenhouse gas emissions exactly right, but the radiative forcing (energy imbalance) in Scenario B was closest, too high by about 10% as of 2009. Additionally, the climate sensitivity in Hansen's 1988 model (4.2°C global warming for a doubling of atmospheric CO2) was a bit higher than today's best estimate (3°C warming for CO2 doubling). Hansen's Scenario B projected a global warming trend from 1984-2009 of 0.26°C per decade. The actual trend as measured by surface temperature stations over that period was about 0.2°C per decade. When corrected for the 10% smaller radiative forcing than Scenario B and the higher climate sensitivity in Hansen's models, his study projected the global warming over the ensuing 25 years almost perfectly. Meehl et al. (2004) took a different approach. Instead of projecting future surface temperature change, they used climate models to attempt to attribute past temperature changes in a method known as 'hindcasting' (as opposed to forecasting). In their study, Meehl et al. show that natural forcings cannot account for the increase in global temperatures in the second half of the 20th century, and that models using both natural and anthropogenic forcings model the temperature change over the 20th century most accurately. "The late-twentieth-century warming can only be reproduced in the model with anthropogenic forcing (mainly GHGs), while the early twentieth-century warming is mainly caused by natural forcing in the model (mainly solar)." A number of studies using a variety of different statistical and physical approaches have, like Meehl 2004, estimated the human and natural contributions to global warming. They universally find that humans are the dominant cause of the observed global warming over the past 150 years, 100 years, 50 years, 25 years, etc. 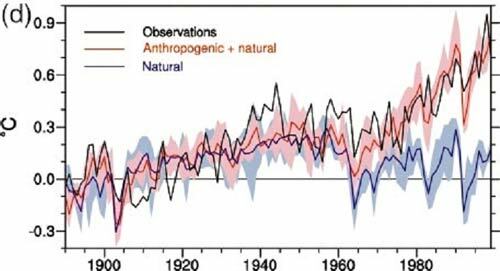 In fact, many conclude that natural effects have actually been in the cooling direction in recent decades (Figure 2). Figure 2: Net human and natural percent contributions to the observed global surface warming over the past 50-65 years according to Tett et al. 2000 (T00, dark blue), Meehl et al. 2004 (M04, red), Stone et al. 2007 (S07, light green), Lean and Rind 2008 (LR08, purple), Huber and Knutti 2011 (HK11, light blue), Gillett et al. 2012 (G12, orange), Wigley and Santer 2012 (WS12, dark green), and Jones et al. 2013 (J12, pink). Stott et al. (2003) took yet another approach, examining surface temperature changes region-by-region across the planet and comparing them to how climate models predicted they should have changed. Stott found that regional temperature changes could also be traced back to anthropogenic global warming. "The causes of twentieth century temperature change in six separate land areas of the Earth have been determined by carrying out a series of optimal detection analyses. The warming effects of increasing greenhouse gas concentrations have been detected in all the regions examined, including North America and Europe….Our results show significant anthropogenic warming trends in all the continental regions analyzed. In all these regions, greenhouse gases are estimated to have caused generally increasing warming as the century progressed, balanced to a greater or lesser degree, depending on the region, by cooling from sulfate aerosols in the middle of the century." "Observed DTR over land shows a large negative trend of ~0.4°C over the last 50 years that is very unlikely to have occurred due to internal variability. This trend is due to larger increases in minimum temperatures (~0.9°C) than maximum temperatures (~0.6°C) over the same period. Analysis of trends in DTR over the last century from five coupled climate models shows that simulated trends in DTR due to anthropogenic forcing are much smaller than observed. This difference is attributable to larger than observed changes in maximum temperatures in four of the five models analysed here, a result consistent with previous modelling studies." Essentially Braganza et al. found that that while DTR is decreasing as expected by climate models, it’s decreasing more than they predicted because daytime temperatures are increasing less than they predict, possibly because the models omit changes in the Earth’s reflectivity from factors like cloudcover and land use change. Here you can see the observed changes in maximum, minimum, mean global temperature, and DTR vs. predictions by the four climate models used in the study. As the lower atmosphere warms due to an enhanced greenhouse effect, the upper atmosphere is expected to cool as a consequence. The simple way to think about this is that greenhouse gases are trapping heat in the lower atmosphere. Since less heat is released into the upper atmosphere (starting with the stratosphere), it cools. Jones et al. (2003) investigated the changes in temperature over the past 4 decades at both the near surface (troposphere) and stratosphere layers, and compare them to changes predicted by a coupled atmosphere/ocean general circulation model, HadCM3. They concluded as follows. "Our results strengthen the case for an anthropogenic influence on climate. Unlike previous studies we attribute observed decadal-mean temperature changes both to anthropogenic emissions, and changes in stratospheric volcanic aerosols. The temperature response to change in solar irradiance is also detected but with a lower confidence than the other forcings." The tropopause is the atmospheric boundary between the troposphere and the stratosphere. Observations indicate that the tropopause height has increased several hundred meters over the past 3 decades. Santer et al. (2003) investigated the causes of this change and concluded as follows. "Comparable increases are evident in climate model experiments. The latter show that human-induced changes in ozone and well-mixed greenhouse gases account for ~80% of the simulated rise in tropopause height over 1979–1999. Their primary contributions are through cooling of the stratosphere (caused by ozone) and warming of the troposphere (caused by well-mixed greenhouse gases). A model predicted fingerprint of tropopause height changes is statistically detectable in two different observational (“reanalysis”) data sets. This positive detection result allows us to attribute overall tropopause height changes to a combination of anthropogenic and natural external forcings, with the anthropogenic component predominating." The layers above the stratosphere are expected to cool as a result of global warming as well, for similar reasons (less heat reaching higher levels as it’s trapped in the lower atmosphere). Jarvis et al. (1998) investigated changes in the thermosphere and ionosphere in 1998 and concluded as follows. "The estimated long-term decrease in altitude is of a similar order of magnitude to that which has been predicted to result in the thermosphere from anthropogenic change related to greenhouse gases." Laštovička et al. (2006) arrived at a similar conclusion. "The upper atmosphere is generally cooling and contracting, and related changes in chemical composition are affecting the ionosphere. The dominant driver of these trends is increasing greenhouse forcing, although there may be contributions from anthropogenic changes of the ozone layer and long-term increase of geomagnetic activity throughout the 20th century. Thus, the anthropogenic emissions of greenhouse gases influence the atmosphere at nearly all altitudes between ground and space, affecting not only life on the surface but also the space-based technological systems on which we increasingly rely." Ocean heat content has increased significantly over the past 40 years. In fact, approximately 84% of the total heating of the Earth system over that period has gone into warming the oceans. Barnett et al. (2005) investigated the cause of this warming signal, and concluded as follows. "[the increase in ocean heat content] cannot be explained by natural internal climate variability or solar and volcanic forcing, but is well simulated by two anthropogenically forced climate models. We conclude that it is of human origin, a conclusion robust to observational sampling and model differences. Changes in advection combine with surface forcing to give the overall warming pattern. The implications of this study suggest that society needs to seriously consider model predictions of future climate change." Gillett et al. (2003) compared observed changes in sea level pressure with those predicted by four coupled ocean–atmosphere climate models and concluded as follows. "Here we detect an influence of anthropogenic greenhouse gases and sulphate aerosols in observations of winter sea-level pressure (December to February), using combined simulations from four climate models. We find increases in sea-level pressure over the subtropical North Atlantic Ocean, southern Europe and North Africa, and decreases in the polar regions and the North Pacific Ocean, in response to human influence….Overall, we find that anthropogenic greenhouse gases and sulphate aerosols have had a detectable influence on sea-level pressure over the second half of the twentieth century: this represents evidence of human influence on climate independent of measurements of temperature change." Zhang et al. (2007) showed that models using natural + anthropogenic forcings do a much better job of matching observed precipitation trends than either natural or anthropogenic alone. The correlation with natural forcings alone is extremely weak - only 0.02. With anthropogenic alone is 0.69, and with both combined is 0.83 over the past 75 years. "We show that anthropogenic forcing has had a detectable influence on observed changes in average precipitation within latitudinal bands, and that these changes cannot be explained by internal climate variability or natural forcing. We estimate that anthropogenic forcing contributed significantly to observed increases in precipitation in the Northern Hemisphere mid-latitudes, drying in the Northern Hemisphere subtropics and tropics, and moistening in the Southern Hemisphere subtropics and deep tropics. The observed changes, which are larger than estimated from model simulations, may have already had significant effects on ecosystems, agriculture and human health in regions that are sensitive to changes in precipitation"
Anthropogenic global warming is caused by an increase in the amount of downward longwave infrared radiation coming from greenhouse gases in the atmosphere. Philipona et al. (2004) measured the changes and trends of radiative fluxes at the surface and their relation to greenhouse gas increases and temperature and humidity changes measured from 1995 to 2002 at eight stations of the Alpine Surface Radiation Budget (ASRB) network. They concluded as follows. "The resulting uniform increase of longwave downward radiation manifests radiative forcing that is induced by greenhouse gas concentrations and water vapor feedback, and proves the "theory" of greenhouse warming with direct observations." "This experimental data should effectively end the argument by skeptics that no experimental evidence exists for the connection between greenhouse gas increases in the atmosphere and global warming." "Changing spectral signatures in CH4, CO2, and H2O are observed, with the difference signal in the CO2 matching well between observations and modelled spectra." This increase in downward and decrease in upward infrared radiation is expected to create an enery imbalance. Trenberth et al. (2009) used satellite data to measure the Earth's energy balance at the top of the atmosphere (TOA) and found that the net imbalance was 0.9 Watts per square meter. (Wm-2) This figure is consistent with the calculations in Hansen et al. 2005 using ocean heat data. "The predicted energy imbalance due to increasing greenhouse gases has grown to 0.85 ± 0.15 W/m2"
Murphy et al. (2009) obtained a similar result. "About 20% of the integrated positive forcing by greenhouse gases and solar radiation since 1950 has been radiated to space. Only about 10% of the positive forcing (about 1/3 of the net forcing) has gone into heating the Earth, almost all into the oceans. About 20% of the positive forcing has been balanced by volcanic aerosols, and the remaining 50% is mainly attributable to tropospheric aerosols. After accounting for the measured terms, the residual forcing between 1970 and 2000 due to direct and indirect forcing by aerosols as well as semidirect forcing from greenhouse gases and any unknown mechanism can be estimated as 1.1 ± 0.4 Wm-2." This is an impressively wide variety of global and regional climate change observations strongly matching the changes predicted by climate models and providing clear fingerprints of human-caused climate change. Professor Scott Mandia has a detailed explanation of why more CO2 causes stratospheric cooling that is well worth a read. What about stratospheric cooling? An increasing greenhouse effect means the surface and the troposphere should be warming, but the stratosphere should be cooling (because the troposphere is trapping more heat and stopping it from reaching the stratosphere). Satellite and weather balloon measurements indeed show a cooling trend in the stratosphere, the opposite of what would be expected if the Sun was causing global warming. And it looks like it isn’t caused by ozone depletion either. It seems very strange that the big umbrella arguments (“It’s not happening”, “It’s not us”, etc) are so far down the list. Why don’t all the instances of each sub-argument count towards the tally of its parent? Response: Initially when I submitted skeptic articles, I did include the umbrella arguments but I stopped doing it fairly early on - was just a bit tedious and I decided to focus on the specific argument being made. If anything, over time, I've even been dividing sub-arguments into sub-sub-arguments and getting narrower with the focus. I think I prefer this way - otherwise "It's not happening" and "It's not us" will be #1 and #2 which is a bit too general for my liking. I covered the stratosphere and other upper atmospheric layer cooling in the Advanced rebuttal, James. Will somebody please post a link to a paper that concludes that an increased greenhouse effect should increase Tmin faster than Tmax. That claim is NOT supported by the papers that are posted here. Instead the papers that are used as references either A) Don't attempt to attribute DTR changes or B) They attribute DTR changes to clouds, aerosols, or land surface changes. Ptbrown31, the shrinking differential between day/night temperatures is entirely implicit in the mechanism of GHGs. You might ask yourself, how could it not be true that more "efficient" concentrations of GHGs in the atmosphere could leave evening temperatures unchanged? "You might ask yourself, how could it not be true that more "efficient" concentrations of GHGs in the atmosphere could leave evening temperatures unchanged?" Of course I am not implying that increased greenhouse gasses would leave evening temperatures unchanged I am implying that I do not think that there is an obvious reason that an increased greenhouse effect should increase evening temperature MORE than daytime temperatures. The Earth emits LW radiation at all times of day and in fact it emits MORE LW radiation during the day. So why is it "entirely implicit in the mechanism of GHGs"? Furthermore, I have indeed looked for papers in various search engines and I have consistently found that the literature attributes the changes in DTR to changes in one of a) clouds b) aerosols or c) land albedo. Stone, D. A., and A. J. Weaver (2002), Daily maximum and minimum temperature trends in a climate model, Geophys. Res. Lett., 29(9), 1356, doi:10.1029/2001GL014556. The recent observed global warming trend over land has been characterised by a faster warming at night, leading to a considerable decrease in the diurnal temperature range (DTR). Analysis of simulations of a climate model including observed increases in greenhouse gases and sulphate aerosols reveals a similar trend in the DTR of −0.2°C per century, albeit of smaller magnitude than the observed −0.8°C per century. This trend in the model simulations is related to changes in cloud cover and soil moisture. These results indicate that the observed decrease in the DTR could be a signal of anthropogenic forcing of recent climate change. 1. Humans are currently emitting around 30 billion tonnes of CO2 into the atmosphere. 2. Oxygen levels are falling as if carbon is being burned to create carbon dioxide. 4. Corals show that fossil carbon has recently risen sharply. 5. Satellites measure less heat escaping to space at the precise wavelengths which CO2 absorbs. Makes sense. Are they also checking to see if the waves that water vapor blocks are escaping less/more? 6. Surface measurements find this heat is returning to Earth to warm the surface. 7. An increased greenhouse effect would make nights warm faster than days, and this is what has been observed. Pretty much the norm for warmer periods. More water vapor available does the same thing. We had a warm period this summer that was all about higher nighttime temps. We also had some of the the highest ever average dewpoints. 8. If the warming is due to solar activity, then the upper atmosphere (the stratosphere) should warm along with the rest of the atmosphere. But if the warming is due to the greenhouse effect, the stratosphere should cool because of the heat being trapped in the lower atmosphere (the troposphere). Satellite measurements show that the stratosphere is cooling. 9. This combination of a warming troposphere and cooling stratosphere should cause the tropopause, which separates them, to rise. This has also been observed. 10. It was predicted that the ionosphere would shrink, and it is indeed shrinking. OK again, now let's go back into the models and try it with water vapor. Continuing a reply to a comment here. "if one presupposes that human activity in some way affects the temperature of the Earth"
a. ozone - remember that 'hole' that we could close by restricting CFC use? b. smog - air pollution controls have successfully reduced smog problems (caused in part by auto exhaust) in Los Angeles. Look also at successful pollution controls in central Europe put in place in the early 90s. c. acid rain - caused by SO2 emissions from industrial activity, reduced by scrubbers. d. dust clouds/storms - over farming in the US dust bowl; coal-fired power plants and urban pollution in Asia. e. CO2 -- there are a lot of studies measuring 'urban CO2 domes' that are directly tied to daily, weekly and seasonal traffic patterns. Of course, there is all that annual CO2 input from fossil fuel consumption. f. clouds - we know how to 'seed' clouds and make rain, at least in limited areas. How many of these human activities 'affect the temperature of the Earth' in some way? Some might say they all do. Weather in a given region occurs in such a complex and unstable environment, driven by such a multitude of factors, that no single weather event can be pinned solely on climate change. In that sense, it's correct to say that the Moscow heat wave was not caused by climate change. However, if one frames the question slightly differently: "Would an event like the Moscow heat wave have occurred if carbon dioxide levels had remained at pre-industrial levels," the answer, Hansen asserts, is clear: "Almost certainly not." The frequency of extreme warm anomalies increases disproportionately as global temperature rises. "Were global temperature not increasing, the chance of an extreme heat wave such as the one Moscow experienced, though not impossible, would be small," Hansen says. I read that most of the CO2 from fuel emissions is located at the upper reaches of the troposphere. Is that true? If it is true, how can claims be made that the extra CO2 is causing faster plant growth? thanks if you have any links for this. #10: "located at the upper reaches of the troposphere." That seems unlikely as the increasing concentrations are measured at surface stations with a wide variety of elevations, notably Mauna Loa at 3400 m. But it would be helpful to know where you read that, because I've seen everything from 'they are well-mixed' to 'they are at highest concentrations near the surface'. "The second problem is that the excess CO2 in question is located at the top of the lower troposphere where it does not nourish any plants." But I think this was my misinterpretation. It's the "CO2 in question" meaning, the CO2 that contributes to heating, not "most' of the CO2. "Among other things, the new studies showed that in the frigid and rarified upper atmosphere where the crucial infrared absorption takes place, the nature of the absorption is different from what scientists had assumed from the old sea-level measurements"
#12: "the excess CO2 in question is located at the top of the lower troposphere"
I can't find that particular line in the excellent RC article you reference. That article deals with CO2 effect saturation, a topic addressed here on SkS. "industrial aerosol emissions are mitigated somewhat during the last three decades. Therefore the actual climate sensitivity to carbon dioxide should be considerably less"
Not sure why you're mixing your aerosols with your CO2 sensitivity. But if, by mitigated, do you mean that the ongoing increase in the magnitude of annual CO2 emissions of +0.67 Gtons/year worldwide somehow indicates a slowdown? If you gave a thought to it, you'd be absolutely sure. BTW, the other thread is continued here. You can't average temperature readings (impossible due to physics) so can't really prove temperatures are increasing. We simply do not know enough to make extreme statements that changes are the result of humans- the total Earth weather system(s) has only studied intensively for 40 years compared to the Earth existing for 30+ million years so only 4 "fingerprints" are real evidence. The rest are changes. Response: [Daniel Bailey] You have me at a loss for what to say (and that never happens). All I can say is that you are not even wrong. I recommend that you start here, then go see the big picture, then top it off with a proper demonstration on how to compare temperature records. cloa513, could you provide more details of the difficulties due to physics, relating to average temperature readings. Also, what makes you state that the earth has existed for "30+ million years" ? Why not write '4.5+ billion years' - the reality ? Do you think it is nearer to 30 million years old ? @cloa513: "You can't average temperature readings"
#16: "the total Earth weather system(s) has only studied intensively for 40 years compared"
Wow. Aside from being factually incorrect (weather and indeed climate science is more than 40 years old): We've only gone into space since the '60s, not even a mere 50 years. So by your illogic, we cannot know anything about what happened before we went into space? However, moon rocks are much older than even '30+ million years' (try 3.5 Byears). We study those moon rocks, as we study signals in the universe that are almost as old as the universe itself! Please, for your own self-respect if nothing else, stop making statements things like that. 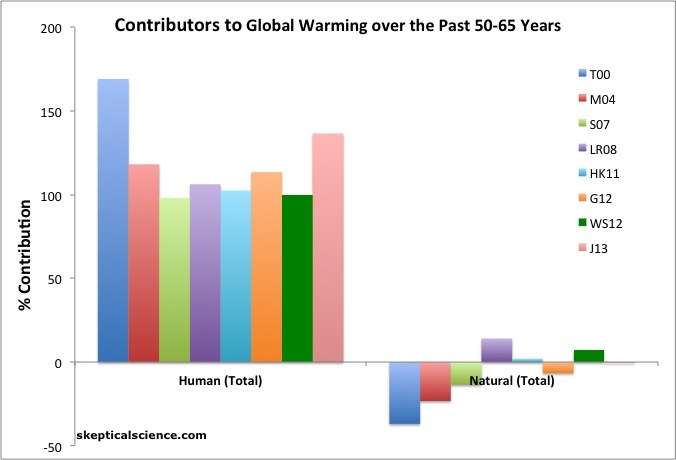 I find your knock-down attributions of warming to anthropogenic causes less than convincing. Perhaps you could clarify a couple of things? 1. More fossil fuel carbon in the air. Presumably you mean 'more light isotope carbon in the air'. How is this light carbon attributed to human emissions? It is trivially easy to think of other causes of a 12C signal -- disruptions of the biosphere will alter the flux of isotopes and change the absolute values, a minute warming will enable methanophages to devour clathrates which have been building up for millennia. Etc -- if I remember correctly I found five possible changes which could give this signal - six if you count the burning of fossil fuels. So, without post hoc ergo propter hoc reasoning, how do we know that the signal is anthropogenic? 2. Fossil fuel carbon in coral. I have the same objection to this one: there is a light carbon signal. How do you assign it to fossil fuel burning? 3. Less oxygen in the air. Well, the methanophages would cause that, as would a major disruption of C-fixing, oxygen-producing plankton. There has been a fall in plankton population of 40% in the last seventy years. Does it not seem more reasonable that oxygen use by civilisation is dwarfed by the huge fluxes found in nature? Having seen a flow diagram of CO2 with an uncertainty of +- 70 Gt in the value of export to deep ocean reservoirs, my take on the whole affair is that we are like a little boy peeing into a reservoir during a cloudburst and worrying about whether we will cause the dam to burst. It's warming. CO2 levels are rising. Attribution please. Your assertions above do not reach the standard of proof. Response: [Daniel Bailey] Here's a recent study with data you can download & play with, so you can see for yourself. Julian Flood@20 Are you questioning the attribution of the observed rise in atmospheric CO2 to anthropogenic emissions? If so, you don't need isotopic arguments to establish that the attribution is correct. The principle of conservation of mass requires that if both man and the natural environment are carbon sources (i.e. emissions exceed uptake) then the annual increase in atmospheric CO2 must be greater than anthropogenic emissions (our uptake is negligible), as it is the sum of the net anthropogenic and natural contributions. This is observed not to be the case, atmospheric CO2 is rising at a rate about 45% of anthropogenic emissions, so the natural environment must be a net sink, and hence is not causing the observed rise. That particular piece of attribution is rock solid. The fact that the long term rise in atmospheric CO2 has been steady at 45% of anthropogenic emissions would be abit of a coincidence if the observed rise were natural and nothing to do with us! I'm afraid you'll have to go through the logic of your case in baby steps, as to me they don't make sense. If the world had only two agents working on CO2 production and sequestration then perhaps you would have a point. However, this is not the case. Just take, for example, the biology of the oceans: numbers of phytoplankton vary as nutrient flows (run-off from land, deep current upwelling, wind-mediated stirring of the top few hundred feet of the oceans, volcanic rain-down, seasonal changes etc etc) and this will change the amount of CO2 pulled down and/or the amount of CO2 given off. So to do your calculation of 'mass balance' you need to know the figures for all of these. Further, and more importantly, you need to know the amount going into and coming out of the biggest reservoir of CO2, the deep ocean. I think the figures you are using for your mass balance are dwarfed by the uncertainties in the figures for all of the above. To illustrate: human emissions go up by X, deep ocean export swings up by 99X, sequestration by phytoplankton goes up by 99.55X. Net increase, .45X. Now add error bars to those figures -- plus or minus 70 Gt. 70! So you don't know the numbers within something like 10X and you're calculating to decimal places. And from this you can claim that it's all the fault of the little boy piddling in the reservoir? I must be misunderstanding something basic. Please explain again a different way and I'll try and follow the logic better. The fact that the long term rise in atmospheric CO2 has been steady at 45% of anthropogenic emissions would be a bit of a coincidence if the observed rise were natural and nothing to do with us! So Zog, when he picked up his first bit of seacoal and threw on his fire, altered the CO2 content of the atmosphere by 45% of the C in that coal? You know that bit in Borat where he looks at someone with disbelief? Picture me like that. How does the process know to only sequester 45% of the extra, and how does it distinguish that 45% blip from all the other processes which are not steady state but which vary with the season, run-off etc. What, in other words, is the _mechanism_? Julian@Flood@22 The mass balance argument does not need to make any assumption about the carbon cycle other than conservation of mass (of carbon), neither does it depend on any knowledge of the individual fluxes into and out of the atmosphere. The diagram below shows annual anthropogenic emissions (for which we have good records), the annual increase in atmospheric CO2 (for which we have accurate records, in this case Mauna Loa), and the difference between total natural emissions and total natural uptake, which can be inferred from anthropogenic emissions and atmospheric increase assuming conservation of mass. This is the green line, which gives total net emissions into the atmosphere from all natural sources (including soil respiration). As you can see, it is always negative, demonstrating that the natural environment is a net sink, and is hence opposing the atmospheric rise, not causing it. The data is shown here it can all be downloaded from the Carbon Dioxide Information Analysis Center CDIAC, the specific datasets you need are: anthropogenic emissionshere and Mauna Loa data here. Note that the error bars on the inferred natural net sink depends on the uncertainty in anthropogenic emissions and measurements of atmoispheric CO2, both of which are small. The bottom line is that the annual rise in atmospheric carbon is the sum of anthropogenic emissions, natural emissions (whatever the mechanism) minus natural uptake (whatever the mechanism). If the annual rise is less that anthropogenic emissions, then the only way that can happen is for natural uptake to excede natural emissions. Julian@Flood@22 wrote "How does the process know to only sequester 45% of the extra, and how does it distinguish that 45% blip from all the other processes which are not steady state but which vary with the season, run-off etc. What, in other words, is the _mechanism_?" It stems from the fluxes of carbon between reservoirs being proportional to the atmospheric concentration and the fact that emissions are rising approximately exponential. The carbon cycle is a dynamical system, which can be described by linear differential equations. If you apply exponential forcing to such linear D.E.s you get an exponential result (with the same rate constant). As both exponentials have the same rate constant, their ratio is constant. I did the D.E.s myself last year to satisfy myself that a constant airborne fraction is what you would expect for an anthropogenic origin, and indeed it is. I've seen the balance argument before and I find it makes me uneasy, not least because there are assumptions unspecified. U_n and E_n may both vary, for example, depending on total emissions and e.g. pollution. Could you follow my logic below and point out how it is in error? Mostly I just follow your reasoning, simply adding an unknown additional input. Civilisation emits CO2 from the burning of fossil fuels, disrupts the natural mechanisms by which uptake occurs and may also cause an increase in 'natural' emissions -- deforestation, methane consumption in permafrost by bacteria as acid rain effects wear off, etc etc. The loss of uptake and the increase in emissions can be lumped together into a single figure, the equivalent of an emission increase(of positive or negative sign), which we will call indirect anthropogenic emissions. We have, for the purposes of my argument, no knowledge of the size or isotopic composition of indirect anthropogenic emissions. The size also seems to be internally unconstrained as U_n, E_n and E_ua may cancel each other out. Now, we know that the level of atmospheric CO2 is not rising as fast as it would if all the fossil fuel emissions were causing the rise, let alone including the indirect emissions. 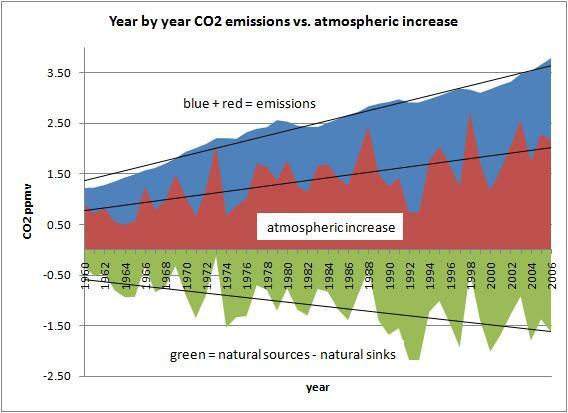 So the natural environment is a net sink and the increase in atmospheric CO2 must be due to (E_ua + E_a). It would seem likely that the sinks will treat E_a and E_ua in the same way, and atmospheric CO2 will therefore contain a proportional amount from each. Question: does the isotopic composition of the dC indicate that the the fossil fuel CO2 addition U_a is sufficient to explain the change in 12C amount, or does the 12C proportion indicate another source of CO2 which is rich or depleted in 12C? It is unlikely that the isotopic proportions of E_ua would match E_a and it may be that a mismatch can give us some indication that there is more going on than your first explanation suggests. I will think about your second post and the explanation there. Are there any papers on this? The difficulty of applying atmospheric CO2 levels to the export from upper to deep ocean reservoirs I would have thought precluded this sort of analysis, but presumably someone must have overcome this. The argument is about what is observed to have happened, and makes no assumptions about what values U_n and E_n actually have, and does not make any assumptions about the sources or whether they vary. Think of U_n and E_n as being the total natural uptake and emissions from natural sinks and sources that actually ocurred in a particular year. We don't know their individual values, we can't directly observe them, but we don't need to know their values, the key point is that we can infer the difference between them and know if the natural environment is a net source or a net sink. Your definition of indirect anthropogenic emissions is unworkable. Firstly issues such as deforestation are already included in anthropogenic emissions as it comes under "land use change". Secondly, the main way in which our emissions have changed the carbon cycle is that there is now far more *uptake* because the atmospheric concentration has risen. The whole reason the natural environment is currently a net sink is due to its response to our emissions. If you want to increase the anthropogenic emissions by including an "indirect component", it just means that the natural environment must be an even stronger net carbon sink than the basic mass balace argument suggests, in which case it remains the case that man is responsible for the observed rise in CO2 (i.e. we agree). As to your question, to understand the ratio if isotopes that you should expect to be in the atmosphere, there is a more important consideration, namely that vast quantities of carbon are recycled between reservoirs annually. If you look at the figures for the fluxes, you will find that the oceans and terrestial bioshphere exchange about 160GTC (IIRC) with the atmosphere each year. This is about a fifth of the atmospheric reservoir, so the residence time (the amount of time a molecule remains in the atmosphere before being taken up by the oceans/biota etc.) is only about five years. This rapidly replaces carbon with "fossil" isotopic signature with carbon of a "natural" isotopic signature, so the change in 12C is not as great as you might expect. However this has nothing to do with the rise in atmospheric CO2 as it is only an exchange of carbon, that is if anything opposing the rise. Thus even though CO2 has risen by about 40% due to anthropogenic emissions, only about 4% of atmospheric carbon is of directly anthropogenic origin (due to the effects of the large exchange fluxes replacing it with "natural" carbon). The export from upper to deep ocean reservoirs is entirely irrelevant. The mass balance argument only involves fluxes into and out of the atmosphere, and only the difference in total emissions and total uptake matters. As to papers on my second post, I haven't seen any papers that use a model of the carbon cycle that is so rudimentary that the result is easily obtained. Anyone who works on the carbon cycle will find it too obvious to publish a paper on, and instead are working on more complex models that take into account things like upper-deep ocean fluxes. The one paper I have seen that uses such a model is the one by Essenhigh (2009), but in that paper Essenhigh fails to understand the distincion between residence time and adjustment time and hence the conclusion of the paper is incorrect. "Second, the observed rate of CO2 increase closely parallels the accumulated emissions trends from fossil fuel combustion and from land use changes. Since the start of almospheric monitoring in 1958, the annual atmospheric increase has been smaller each year than the fossil fuel input [DK the difference is even bigger if you include land use changes]. Thus ocean and biota together must have been a [DK net] global sink rather than a source during all these years"
So it is in the litterature, just that it doesn't merit much discussion anymore as it is so well known (I have seen it given a similarly brief mention in a paper or two). If there is one observation where natural variability can be ruled out, this is it. We know for sure that the rise in atmospheric CO2 is anthropogenic, as the theory that it is from natural sources is 100% falsified by the observation that the annual increase is smaller than fossil fuel emissions. Julian, Dikran - Odd thing, that; I tried posting there too, my post apparently did not survive moderation. It showed up as "awaiting moderation", but never made it to the blog comments. I'm saddened by that approach, when Dr. Spencer had issued the challenge in the first place. If he wants to issue such quixotic challenges, he should accept responses too. My posts on that thread have now also started to be "waiting moderation", which is very indeed very dissapointing. If his hypothesis is falsifiable it should be straightforward for him to have answered my question directly. If it is not falsifiable then the challenge is meaningless. My most recent was timestamped "February 4, 2011 at 8:36 AM". The argument is about what is observed to have happened, and makes no assumptions about what values U_n and E_n actually have, and does not make any assumptions about the sources or whether they vary. Think of U_n and E_n as being the total natural uptake and emissions from natural sinks and sources that actually occurred in a particular year. We don't know their individual values, we can't directly observe them, but we don't need to know their values, the key point is that we can infer the difference between them and know if the natural environment is a net source or a net sink. Yes, but this means you have no knowledge of the sizes or even composition of the various sinks and sources. In particular you have no knowledge of the proportion of the atmospheric component which is due to fossil fuel. Without that knowledge you cannot know if decreasing, or even eliminating, fossil fuel emissions will have much impact on atmospheric CO2. Where we disagree is in the relative importance of the various components of anthropogenic CO2. They are unquantified and give no guidance on the best course ahead. Lumping any particular flux into 'land use change' or whatever does not improve the situation, it just makes the assertion a tautology. My question was whether isotope changes fit in with the 45% addition to the atmosphere. Perhaps I can ask the question again. Does the isotope change in the atmosphere match that expected from the amount of fossil fuel CO2 produced and not taken up by the enhanced sink? If not, does the discrepancy give us any hint as to the source of other inputs or changed exit fluxes? Here we disagree. Deep ocean clathrate deposits are quite capable of belching methane directly into the atmosphere (where they rapidly oxidise) or CO2 from methanophage digestion. In your initial crude equation this does not matter, as everything just gets lumped into the same number. However, in the real world whether the atmospheric CO2 rise is due to a pinch of fossil and a peck of something else matters enormously. The simple mass balance equation gives us no useful knowledge. Is the MWP deep water warming clathrates? A fraction of a degree would do it, and enormous fluxes of light isotope carbon would be released, handily just at the 800 year point which seems to be the lag between warming and CO2 increase in the historical record. As to papers on my second post, I haven't seen any papers that use a model of the carbon cycle that is so rudimentary that the result is easily obtained. Anyone who works on the carbon cycle will find it too obvious to publish a paper on, and instead are working on more complex models that take into account things like upper-deep ocean fluxes. The one paper I have seen that uses such a model is the one by Essenhigh (2009), but in that paper Essenhigh fails to understand the distinction between residence time and adjustment time and hence the conclusion of the paper is incorrect. So, as it is elementary, there is a breakdown of the method in a text book? Even so, I'd like something more than a hat tip to increased carbon dioxide automatically keeping the 45% in balance. It seems unlikely. Thanks for the reference to Essenhigh, I've had correspondence with him re his paper on albedo. A gentleman with an engineer's grasp of reality. I'll read that paper with interest and any refutations you can reference. Re your last post: this just reiterates the mass balance argument. It tells us nothing of attribution. Which is why I ask about expected isotope ratios. Ferdinand Englebeen (I think it was in his WUWT posts) mentioned that the ratios are not as expected. Have I remembered that correctly? "Yes, but this means you have no knowledge of the sizes or even composition of the various sinks and sources." Knowledge of the size or composition of the sinks is not necessary to establish that as a whole, the natural environment is a net sink. This fact is established by the fact that the difference between total environmental emissions and total environmental uptake is equal to the difference between the increase in atmospheric CO2 and anthropogenic emissions. If the natural environment is a net sink, i.e. it takes more CO2 out of the atmosphere each year than it puts in, how can it be the cause of the observed increase? Do you agree that the mass balance argument demonstrates that the natural environment is a net sink? If not, can you explain why? Julian Flood - Isotopic ratios are indeed falling (see here in How do human CO2 emissions compare to natural CO2 emissions). And that rate of change correlates to our emissions. Given the rather massive exchange of the natural carbon cycle, direct attribution is going to be a challenge either way. But the mass balance issue (that we're emitting ~29 GT/year of CO2, and that atmospheric concentrations are rising at 15 GT/year) indicate that we are making a difference in the balance. You've presented no arguments against the total mass balance points other than arguing uncertainties in the natural carbon cycle - we have no such uncertainties about our emissions and the rate of atmospheric increase. Even +/- 50 GT/year uncertainties (balanced) in the natural carbon cycle makes no difference to the fact that we emit 29 GT and only see 15 GT staying in the atmosphere, indicating that nature acts as a sink for the additional 14 GT/year. And that's supported by the ongoing changes in isotope ratios. Your argument against mass balance calculations doesn't hold up. If we were to stop emitting CO2 tomorrow I would expect ~2ppm/year decreases in CO2 for a while, slowing and then halting somewhere above the 280ppm preindustrial level when carbon cycle exchanges balance out with the pulse of CO2 we have contributed over the last 150 or so years. "Does the isotope change in the atmosphere match that expected from the amount of fossil fuel CO2 produced and not taken up by the enhanced sink? If not, does the discrepancy give us any hint as to the source of other inputs or changed exit fluxes?" I've not done the calculations myself, but if they didn't match there would be a paper demonstrating that they didn't match, and I'm pretty sure we would have heard about it. "So, as it is elementary, there is a breakdown of the method in a text book? Even so, I'd like something more than a hat tip to increased carbon dioxide automatically keeping the 45% in balance. It seems unlikely." See the paper by Canadell et al in PNAS the bit about the ariborne fraction being 0.45 is about half way down the second column on page 2. The AF is changing slightly but it has been about the 0.45 mark for a long time. "Here we disagree. Deep ocean clathrate deposits are quite capable of belching methane directly into the atmosphere (where they rapidly oxidise) or CO2 from methanophage digestion. In your initial crude equation this does not matter, as everything just gets lumped into the same number." If enough calthrate deposits were released that the natural environment became a net source of CO2 into the atmosphere, the annual rise would be greater than anthropogenic emissions. But we know this is not the case. Prof. Essenhigh is indeed a gentleman, however that particular paper is flat wrong. He makes no distinction between residence time and adjustment time and says there is a confusion in the 1990 IPCC WG1 report. However, if you look at the report, you will find the terms are well defined (Table 1.1, page 7) and in section 1.2.1 there is a paragraph that explains why it is the adjustment time that is relevant to a discussion of the change in atmospheric concentration not the residence time. Prof. Essenhighs calculation of the residence time is essentially correct, it is the corrollory that is incorrect. Julian, if you want a peer reviewed paper with the mass balance argument, try Raupach et al., it is on section 2.1 on the first column of page 2. Nice try! Argument from absence is a new one on me. Julian Flood - I think you're being rather disingenuous here. Our well known emissions represent twice the well measured atmospheric increase. Isotope changes correlate with fossil fuel consumption. It is entirely, completely irrelevant what the various sources other than fossil fuel emissions are - our emissions are making the difference in changing CO2 levels, up 115ppm since the beginning of the industrial era. CO2 levels are rising, and without our emissions they would currently be falling. The isotope evidence is no more than a supporting (albeit very interesting) character in this play. Arguing (as you continue to) about attribution, rather than sum effect, is just a pointless distraction. Isotope changes correlate with fossil fuel consumption. At last, some facts that mean something. Where's the reference please? I've been looking for a paper which calculates that the isotope changes are caused by, and only caused by, fossil fuel emissions. Your other assertions.... could you work through the logic for me? I can see no way from the mass balance argument that you can assert anything other than very weak arguments: our emissions have contributed some increase to atmospheric CO2; if we stopped burning fossil fuel there would be some decrease in atmospheric CO2; fossil fuel burning is one contributor of unspecified size to our climate problem. Sum effect is meaningless in this arfgument because without attribution you do not know relative quantities. That's why the isotope measurements and attribution matter. Incidentally, your first post simply restates the mass balance argument which you may have noticed does not contribute anything other than the 'some of the CO2 from fossil fuel burning remains in the atmosphere.' As, of course, does some of the CO2 from all the sources. Julian Flood - The earlier link I provided to How do human CO2 emissions compare to natural CO2 emissions has that information, specifically references to Ghosh 2002. That's an excellent reference with a good discussion of the isotopic balances of various sources and sinks. As to the mass balance point - we actually know the size of our contribution: 29GT/year to the list of sources. We see 15GT/year increases in the atmosphere, indicating that 14GT/year of our contribution to the CO2 balance are absorbed by natural sinks. How can our contribution possibly be clearer than that?!? How can it not be us causing the increase? If the CO2 increase was larger than our emissions, then there would be plenty room for discussion as to which part of that CO2 rise was due to us. But it's not - it's much less than our emissions. We cause all of the rise in CO2. Julian Flood - It's also well worth looking at IPCC AR4 for a collected discussion of the isotopic data. #25: "The difficulty of applying atmospheric CO2 levels to the export from upper to deep ocean reservoirs ... presumably someone must have overcome this." See Physical Chemistry of CO2 Absorption for a very detailed analysis. #30: "Where we disagree is in the relative importance of the various components of anthropogenic CO2. They are unquantified ... ."
This seems to be on the verge of becoming a strawman. Is what you are really questioning the reality of anthropogenic contribution to increasing atmospheric CO2? Or are you searching for a means to quantify its magnitude? In either case, data exist to resolve the questions to a reasonable degree of certainty. We can track local atmospheric CO2 concentrations against seasonal fuel use patterns (several authors have done this at various locations in Europe); we can see weekly and diurnal traffic patterns in urban environments (multiple papers on urban 'CO2 domes') and a prior thread noted that land sources of CO2 can be tracked via CO and black carbon deposits. #37: "Sum effect is meaningless in this arfgument ... ."
Perhaps you should spend some time looking through EIA CO2 emissions data before making that claim. But on the whole, I must agree with KR; the sum is greater than any individual part. Julian@35 wrote "Nice try! Argument from absence is a new one on me." Experience has told me that when genuine attempts to explain the science in a friendly and open manner get a response such as the one given above, it is not worth the bother continuing. This is especially true of those who (a) don't give answers to questions intended to clarify someones position (you did not answer the questions posed in post 31) (b) do not acknowledge when evidence is presented that answers an argument that they have presented (for instance the Canadell paper that demonstrates that the airborne fraction has been pretty constant at about 45%) and (c) do not pay attention to key issues (for instance that the volume of fluxes are irrelevant, whether atmospheric CO2 rises of falls depends only on the difference between total emissions and total uptake). You have done all three of those things in this discussion. If you don't understand the mass balance argument, you may want to consider that perhaps the problem might be at your end of the discussion. BTW, you wrote: "No, you can't assume that." - I didn't assume that, it is a direct (and rather obvious) consequence of the principle of conservation of mass. Julian Flood wrote : "Argument from absence is a new one on me." I haven't come across any papers that demonstrate that the Theory of Evolution is false : is that an "argument from absence" or a demonstration of the facts ? Sorry for the long pause, I got rather busy and dropped the ball. At one stage I thought the mass balance argument would allow us to say something about changes in sources and sinks, but further thought led to more doubts. The mass balance argument demonstrates that sources are greater than sinks. However, because it does not attribute any numbers to any of the many sinks and sources, it is unable to distinguish between a change in either: for example, see my painstaking plod through the equations above. If you take any source X larger than 14 Gt out of the equations and lump all other sources together as 'natural plus human' then the proponents of the mass balance argument say that all the extra CO2 must be caused by X. This seems to be an error. If sources are in balance and then two sources, X and anthropogenic, increase then all you can say is that some of the increase is caused by fossil fuel burning. If you have no size for X then all you can say is that X+anthropogenic is greater than the sinks by at least 14 Gt. The sinks have increased by enough to absorb (X+anthropogenic) - 14Gt. No, we cause some of it, that is all the mass balance argument allows you to say. That's my best shot -- we are obviously talking past each other and I am missing some hidden subtlety in your posts which makes things clear to others but not to me. I have seen a post by Lubos Motl where he states that he is sure that the CO2 increase is anthropogenic. I think I'll go and ask him. Thank you all for an illuminating discussion. Can you explain why it would be informative to exclude some natural source and lump the remainder of the natural carbon cycle together with anthropogenic emissions? We all know that some parts of the carbon cycle are sources and some sinks. WHat is important is whether CO2 levels would be rising if not for anthropogenic emissions, and the answer is quite clearly "no, they would be falling" (which we know because the net effect of the natural environment as a whole is to absorb about half our emissions). Given that CO2 levels would now be falling if we were to cut our emissions to zero, it seems odd to suggest we are not 100% responsible for the current rise. Try giving a specific example, giving values for all natural and anthropogenic sources and sinks, where the annual rise is less than anthropogenic emissions and where the natural environment is a net source. You will find that you are unable to do so, but the attempt will probably demonstrate to you why the mass balance argument is correct. "No, we cause some of it, that is all the mass balance argument allows you to say." It should be obvious that you are missing something here, given that we don't actually need the mass balance argument (or the assumption of conservation of mass) to know that we are the cause of at least some of the observed increase; we already know that simply because our emissions vastly exceed our uptake. It should be no surprise then that the addtion of a constraint (conservation of mass) allows us to make a stronger argument. I have repeatedly explained that you don't need to know the value of individual fluxes to know that the natural environment as a whole is a net sink. If you shared a bank account with your partner and always put in $100 a month more than you spent, but observed your monthly balance only increased by $50 a month, you would know your partner was a net sink (to the tune of $50 a month) without needing to know where he/she spent the money, or how much he/she spent in total or how much he/she deposited each month. The mass balance argument is essententially analogeous. Currently all of the annual rise in CO2 is caused by man. Since nature absorbs about 1/2 of our annual emissions, one can stretch the word "cause" to say that the rise is caused by the lack of nature's ability to absorb all of our emissions. Part of the lack is due to warming oceans. But our current CO2 causes that warming (averaged over decades to smooth natural variations). A footnote: natural warming following the LIA is the cause of a small part of the historical rise in CO2 (e.g. from 280 to 285 or something similar). But using the common meaning of "cause", man currently causes all of the annual rise in CO2. Julian Flood - Having read and puzzled over your post, I have a question for you. When you state "No, we cause some of it, that is all the mass balance argument allows you to say", is that because not all of the CO2 molecules come from our emissions? Certainly there is continuing exchange of CO2 with the biosphere, with the ocean, etc. If so, yes - lots of the atmospheric CO2 comes/goes without our interaction, even though that's irrelevant to the current discussion. Or (as we have been emphasizing), are you stating that the atmospheric CO2 would be rising without our (well known) contributions? That would be an error. Without our emissions CO2 levels would be dropping - we are wholly responsible for the current increases in atmospheric CO2 levels, which equal half our emissions. The rest is being absorbed by nature. Without our emissions, which without other sources or sinks would cause a >4ppm/year increase? CO2 levels would drop from current values, as CO2 worth ~2ppm/year of our emissions is currently being absorbed by natural sinks. With our emissions? Rising at >2ppm/year. While we are not responsible for every molecule of CO2 out there, we are completely responsible for the current rise in CO2 levels, the change. It doesn't matter if the sum of sources and sinks is 5x our throughput, 10x, or 100x - we're responsible for the current difference between the source/sink levels. Can you explain why it would be informative to exclude some natural source and lump the remainder of the natural carbon cycle together with anthropogenic emissions? Because that highlights the logic of the argument. Any increase outside the lumped-together sources can be pointed to as the cause of all of an increase. If one postulates e.g. an increase in metabolised methane from the permafrost (this is, IMHO, uncontentious as the suppression of methane efflux by acid rain is documented), or perhaps warmer deep water is increasing CO2 emissions from metabolised clathrates, then one can by the same line of reasoning say 'it's all coming from the permafrost'. This would of course be wrong, one needs to add up all the changes and then -- in this case -- one can say 'it's X Gt from permafrost and 27 Gt from fossil fuel. The proportions are X:27 and, since we don't know the absolute size of the sinks, we do not know what eliminating fossil fuel emissions will do to the rate of sink, but it will remove the CO2 in proportion to the contribution, i.e. X:27.' If we cut all of the fossil fuel emissions then we might find that the CO2 levels continue to increase because X from permafrost is bigger than the enhancement of the sink. Because we do not know the actual size of the permafrost contribution, we do not know the actual size of the sink which is taking up all but 14 Gt of the enhanced (fossil emissions + permafrost contribution). We do not know enough to make a meaningful statement. What is important is whether CO2 levels would be rising if not for anthropogenic emissions, and the answer is quite clearly "no, they would be falling" (which we know because the net effect of the natural environment as a whole is to absorb about half our emissions). No, that is not the case. We know only that all sinks add up to more than the sum of all the sources. We do not know that CO2 levels would be falling because we have not measured the sinks and sources. See above. Given that CO2 levels would now be falling if we were to cut our emissions to zero, it seems odd to suggest we are not 100% responsible for the current rise. No, you cannot truthfully make that assertion -- I could say 'if we cut our emissions to zero then the rate of increase of atmospheric Co2 would only diminish by 10%' and I would be talking equal nonsense. See above. This is just assertion of what we are discussing and brings us no further forward. It does point up one of the problems I'm trying to understand: if we cut to zero, would the increase in atmospheric CO2 entirely cease? My contention -- perhaps too strong a word -- my fear is that it would not. I have repeatedly explained that you don't need to know the value of individual fluxes to know that the natural environment as a whole is a net sink. If you shared a bank account with your partner and always put in $100 a month more than you spent, but observed your monthly balance only increased by $50 a month, you would know your partner was a net sink (to the tune of $50 a month) without needing to know where he/she spent the money, or how much he/she spent in total or how much he/she deposited each month. The mass balance argument is essentially analogous. But if you have a beneficent uncle who is adding untold amounts to your account, or not, depending on how his ulcer feels, you can then say nothing about what's going on. Your daughter, meanwhile, has found a way of silently tapping off an increased allowance, and a direct debit, which you have had running so long that you'd forgotten it, has ceased. Now you do not know who is doing what because there are too many unknowns, as I have repeatedly pointed out. Unless you know the details about what's going on, you don't know what's going on and you cannot make any meaningful statement about what's going on. I agree that the mass balance argument is analogous. It is, however, incomplete in your presentation. Perhaps here we have an insight into our disagreement -- you believe that the sources and sinks are all accounted for and the only things to be considered are one input and one output, while I am not sure they are, which is why I ask these questions. My own guess is that we have screwed up one or more biological sinks, the pull down of 12C has decreased, leaving more 12C in the atmosphere, and we're misinterpreting that as part of the fossil fuel signal. But that is just a guess -- it might even be MWP deep water at last reaching the deep ocean clathrates. Or something else. "Try giving a specific example, giving values for all natural and anthropogenic sources and sinks, where the annual rise is less than anthropogenic emissions and where the natural environment is a net source. You will find that you are unable to do so, but the attempt will probably demonstrate to you why the mass balance argument is correct." Can you explain why you responded to every part of my post, except that one? Regarding the analogy regarding bank balances, it seems I will have to spell it out. The partner represents the natural carbon cycle, all of it, so there is no benificent uncle (unless you think aliens are coming here in flying saucers and taking carbon from the atmosphere). As I said, we don't need to know anything about the transactions performed by the partner to know that he/she is a net sink. [S]He could be putting in and taking out millions of dollars a month, or hundreds, and it wouldn't make any difference to the argument at all. The change in bank balance only depends on the difference between income and outgoings, not on the volume of transactions. You say I that I believe all sources and sinks are accounted for. That is not correct, and the mass balance argument does not depend on knowledge of the sources and sinks, I have said that repeatedly, so you ought to know that by now. The mass balance argument is a means of inferring the difference between total natural emissions and total natural sources. That is all you need to know to be sure that nature is a net sink and hence CO2 levels would be falling if not for our emissions. Now, please try an address the challenge repeated above, can you give a counter-example, using any values you like for the fluxes, even if they are not realistic (as long as they are positive real numbers). If you are not willing to try, or not willing to admit that you can't find a counter example, what would that imply? Julian Flood - Your "beneficent uncle" and "unscrupulous daughter" are variations of the LGM hypothesis - Little Green Men, unknown and unpredictable. You're essentially stating that although we are adding CO2 twice the level seen as atmospheric rises (and hence sources exceed sinks by the amount of atmospheric rise), if we were to change behavior we would not see the expected decrease in atmospheric CO2 (as sinks would then exceed sources by ~2ppm/year). Because according to you LGM would change the source/sink balance. Complete nonsense, Julian. We're responsible for the current rise, no matter how much you try to invoke LGM to dodge it. Julian Flood - One last attempt, Julian. We are putting an amount "A" into the carbon cycle, a well known amount taken from our fossil fuel use. We're seeing a rise in atmospheric CO2 of "1/2 A", indicating that sources currently exceed sinks by that amount. If we remove an amount "A" from the sources, sinks should then exceed sources by "1/2 A", causing a drop in atmospheric CO2. And as we are responsible for amount "A", we are responsible for the "1/2 A" rise. We are responsible for sources currently exceeding sinks. The only way that CO2 would not drop if we stopped emitting would be if the carbon cycle responded in a non-linear fashion (the LGM of the previous post) - and since the carbon cycle is an order of magnitude larger than our contribution, that would be unreasonable unless you have a testable hypothesis of why it would be different, and some evidence to show it.